Girl Kuripot Girl Kuripot: GK Giveaway, Ate Gay sa MOA Arena this November 30 (tomorrow)! GK Giveaway, Ate Gay sa MOA Arena this November 30 (tomorrow)! It's a holiday tomorrow, right?! =) Here's something fun to do! Bring somebody to a comedy concert with this quick GK giveaway from our friends from the MOA (Mall of Asia) Arena! 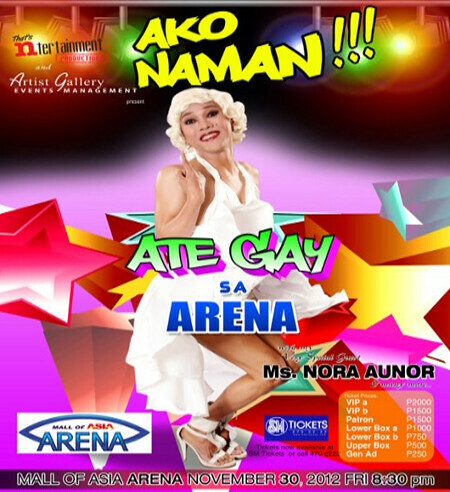 I'm giving away 2 winners 2 Lower Box A tickets each to Ate Gay's Ako Naman Concert! Step 1: Follow MOA Arena on FB. Step 2: Follow Girl Kuripot and Melody Co (make sure it's the Fan Page) on FB. Step 1: Follow MOA Arena on Twitter. Step 2: Follow @Girl_Kuripot and @miloodee on Twitter. You have until November 30, 2012 12 noon! Lower Box A tickets of the winners will be given at the venue SM MOA on the day of the concert from 6:30 PM to 8 PM. Winners will be contacted via mobile and email. Enjoy! If you don't win and still want to watch, ticket prices are in the poster =) You can buy at SM Ticket counters. US Potato Board Thanksgiving Giveaway Winners! PAL, 200 Flights Up for Grabs! Mukhang Pera, Win a 2N Stay in Bohol! Salon de Rose, Win a Trip to Singapore! Giveaway - 25 *Free Sunglasses for your Travels! Intrepid Travel, Win Trips Every Day! DestinAsian, Win a 3N Stay in Bali! SM Cinemas, One Free Movie Day in December! Giveaway - Win a Potato Experience! Gran Prix Hotel Pasay, Win an Overnight Stay! Travel + Leisure, Win a 3N Stay in Phuket! Etravel PH, Win a 3N Stay in Bali, Indonesia! Girl Kuripot Joins Sulit Clique! BTAP, Win 3N Stay at Rosedale Kowloon Hotel!